The images of atrocity, either analog or digital, are always the trace of an encounter between the gaze of a photographer or a cameraman and a human being suffering from the painful effects of man-made violence. The archive images resulting from such an encounter raise some inevitable questions: who took them and for what purpose? Is it possible to retrace the process that led to these shots? What do they hide beyond what the eye can see? Owing to their defective nature their defective nature and the changes they have endured throughout history, these images strongly contribute to shape collective memory by becoming real sites of memory for ethnic or national communities. Therefore, the archive of human pain, encompassing a wide range of public spaces – such as museums, monuments, artworks, memorials, human rights associations and so on – is a reservoir of images to stimulate grief or fuel action for social change. This introduction has two main aims: on the one hand, it investigates the circulation of such images within the visual sphere and their social or political uses; on the other hand, it provides the paths of research and the new findings extensively analysed in the contributions included in this volume. The essay analyzes the traumatic dimension of the images of rubble produced by German cinema and photography in the aftermath of the Second World War. Drawing on Sebald’s reflections on the inability of literature to bear witness to the atrocious experience of the bombings endured by millions of German citizens, this contribution proposes an analysis of the gaze employed in depicting the dramatic condition of the country. In particular, the refusal of the codes of realism and the impulse towards the scenographic portrayal of rubble and ruins, about which scholars largely agree, is here re-read not as evidence for an escape from reality, but as a re-emergence of an ornamental (Kracauer) and anesthetizing (Jünger) visual matrix typical of the aerial point of view and, so, typical of the attacker’s gaze. This resurfacing is testified by two key figures engraved in the landscape of rubble: the skeleton in X-rays and the surface of abstract signs which cross-references the view from above; both strip the flesh from the body/landscape, so that the former is in some way included in the latter. As it coincides not only with the gaze that Germany suffered at the end of the war, but also with that imposed by the Nazis at its beginning, the aerial perspective and the corresponding affectless mode summarizes the specificity of the trauma that Germany underwent, rekindling the conflict of self-representation of the defeated country. The article discusses the filmic representation of the Holocaust within the framework of the archive. To what extent adopt films archival techniques and operations or constitute something like ‘cinematic archives’ of the Holocaust? Films can assemble footage from the archive and bring it in a specific order but they can also use it as model for cinematic recreations. Thus, the preservation of visual and non-visual traces in feature films is always transformative and sometimes even distorting. By repeating and circulating ‘images of images’ such films turn visual heritage into a pattern of visual icons and create a stock of usable imagery, which in reverse also leaves other memories and remnants to forgetting. Such technique of repetition is also the basis for the transtextual character of cinematic archives, which also interconnects the storage (the assembling of images) with the register (the references towards earlier cinematic representations). To describe the logic, operations and the impact of cinematic archives of the Holocaust the article reviews such films as Schindler’s List, X-Men, The Pianist and Everything Is Illuminated, and discusses theoretical approaches by Gérard Genette and Jacques Derrida. This paper explores the use of archival images in Jem Cohen’s Buried in Light (Central and Eastern Europe in Passing, 1994), and Evening’s Civil Twilight in Empires of Tin (2007-2008) in order to read the development of his reflections on history and memory. The archive is intended “in its concrete manifestation as a collection of audiovisual documents of the past and in its ontological dimension, indicating social and cultural processes of remembering and forgetting” (Noordegraaf, 2011). Strongly influenced by Walter Benjamin, Cohen conceives history not as a chronological line, but as a collection of traces (shots) mapped out by the documentary collagist (filmmaker) that simultaneously speaks about the past and the future in a layered present tense (editing). Mainly as an essay film form, his work is constructed by film fragments of places and people that build an unofficial history with a geographical form. Cohen calls such way of collecting shots “the archive of the feet” (2000). Starting with his first “historical” film/video, This Is a History of New York (The Golden Dark Age of Reason, 1987), the paper analyzes Cohen’s conception of history and progress through the archive of human pain, and in relation to Benjamin’s work. In 18.Oktober 1977 – a cycle of fifteen paintings about the German Autumn and the Baader-Meinhof Gang – Gerhard Richter deals with the trauma of terrorism confronting himself with the crystallized memory of the “crime scene” – specifically, the photos of the dead bodies in Stammheim taken by the police and then published in Stern – that he recomposes, giving us back an experience of blurred, vague, enigmatic vision, therefore forcing us to look in a different way and to search for what is hiding from our sight. The work of Richter is a gesture of rewriting archival images that thus becomes an act of redemption. He opposes to the obscene visibility of the death showed in the photographs of the police – exhibited as proofs of guilt or exploited to satisfy a desire of revenge – the spectral vision of an elementary truth: death, even in the exceptional form of terroristic violence, represents a mysterious and utter horizon that no political gesture can recompose. It is exactly in the death, experienced as a common but unspeakable fate, that Richter finds the humanity of the terrorists, helping us to approach the comprehension of trauma. By analyzing some case studies that develop in different ways the symbolic value of home pictures in terms of restorative burial, the article reflects on the relationship between photography and memory in response to the campaign of political repression and terror occurred in Argentina and Chile from the 1970s to the 1990s. In the last decades, several artists have based their works on the reuse and recontextualisation of private photos, aiming at denouncing the denial of burial. This study will firstly focus on two well-known projects by Argentinean photographers – Marcelo Brodsky’s Buena Memoria (Good Memory, 1997) and Gustavo Germano’s Ausenc’as (Absences, 2006) – which not only highlight the physical absence of the disappeared, but also translate the aesthetics of the family into a depiction of grief and violent past. Secondly, the study moves into the Chilean political arena, by examining some sequences from two documentaries – Silvio Caiozzi’s Fernando ha vuelto (Fernando Returns, 1998) and Patricio Guzmán’s Nostalgia de la luz (Nostalgia for the light, 2012) – it will demonstrate how it is possible to turn the natural assumption of “(private) images are relics” into “relics are (private) images.” By using both social practices of memory and visual artistic operations, it is possible to notice on the one hand an aesthetic need to give real identity back to the victims; on the other hand, a practice of looking, which is specifically marked by postmemorial interpretations, and backshadowing. Facing the genocide perpetrated by the Khmer Rouge in Cambodia, The Missing Picture (2013) by Rithy Panh is an intimate meditation on the limits and the power of cinema. The same query drives Công Binh, la longue nuit indochinoise (2013), the documentary essay that Lâm Lê dedicated to worker-soldiers recruited by force in French Indochina to serve as slave labor in France during World War II. Both films make extensive use of so called “archive images” totalitarian propaganda films, photographs, and documents originating from the colonial administration, as well as newsreels, etc. These archives corroborate the fantasy of all powers: that of a mass of faceless bodies. There are only two reverse shots possible for false image of the Khmer Rouge: either the shots made by Rithy Panh – tiny colored clay figurines, representing in miniature the formerly murdered missing bodies; or, in Lâm Lê’s movie, interrupting the sequences of oral testimonies and archive images, the choreographed scenes and a water puppet show which transpose the distress of families who stayed in Vietnam and were left without news for years. What is at stake in the rhapsodic construction of the two films is not the giving of an image where it is missing, but encouraging viewers to encounter a work of imaginary elaboration. 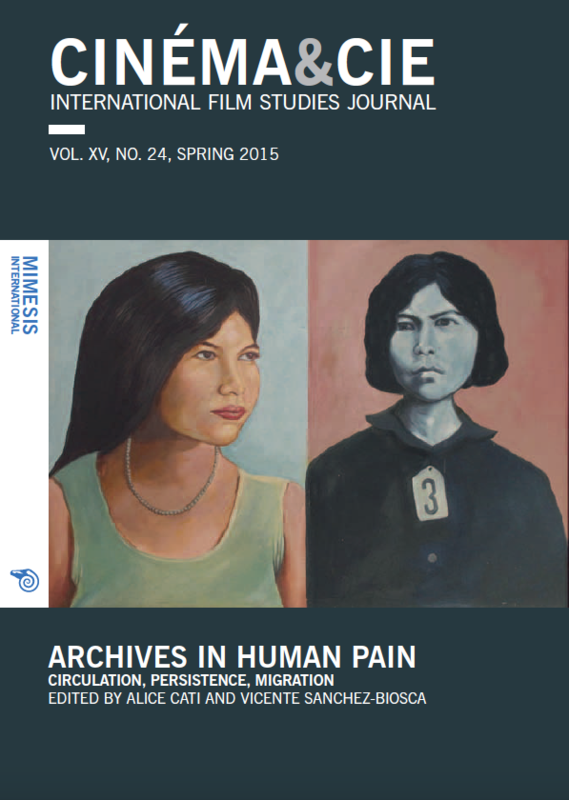 This essay examines the production and circulation of the mug shots of the detainees generated by the Khmer Rouge machinery at the centre of torture S-21 (Phnom Penh). When they were taken, these images played a key role in the process of identifying, repressing and killing those considered enemies during the regime of Democratic Kampuchea (1975-1979). Yet, since the collapse of the Khmer Rouge, these photographs have been used to denounce their creators as if the pictures had kept no trace of their original intention and were reversible. With this purpose they have migrated from museums and art galleries to the stage, from illustrated books to the cinema and from the Internet to the criminal court devoted to judge the former KR leaders. I argue that the stories of the phenomena must be told in close relationship: firstly, the deciphering of the archive of mug shots, that is, the discovery of the negatives, the extraction of new prints, and their availability; secondly, the circulation through different public spaces and media; thirdly, the changes in the geopolitical context in such a controversial region for the international equilibrium. Although these three levels do not evolve into a mechanical dependence, they are intricately interrelated and prove the advantages of articulating technological, semiotic, and political uses of an archive that concentrates within it humain pain experienced at the very core of the 20th century. The Danish television series Forbrydelsen is representative of the successful intertwining of local narratives with transnational media within the scenario of contemporary Nordic Noir. This paper considers the series’ stylistic and production values to show how a “medium-concept” narrative, with its hybridization of genres, portrays highly debated social issues and raises a nationwide public discourse on them. The mingling of genres (melodrama and noir, sensational and crime fiction, and so on) produces a complex narrative that revolves around the wounded body and psyche of the female detective. The melodramatic mode of representation generates a dystopic vision of the contemporary world, visually depicting violent clashes between the individual and the agents of power, and the morally ambiguous compromises such clashes create for the nation. In the last decades moving images have become a common feature not only in art or film museums, but also in a wide range of institutions devoted to the conservation and transmission of memory. This paper focuses on the role of audio-visuals in the exhibition design of contemporary history and memory museums. Starting from a classification of the different kinds of audio-visuals used in these institutions, I will analyze not only “literal” presence of audio-visuals in exhibitions, but also the ways in which the museum dispositive can incorporate elements of the cinematic dispositive. I will show how, on the one hand, exhibitions can be structured according to cinematic principles such as montage and sequentiality and, on the other hand, how the configuration of museums space can be deeply influenced by the “classic” cinematic dispositive and its components (screen, dark room, projection, sitting spectator).